Posted on Fri, Jan 20, 2012 : 2:59 p.m. It will be up to the Washtenaw County Prosecutor’s Office to determine if the two 15-year-olds arrested in Thursday’s shooting in Pittsfield Township will face adult charges, officials said Friday afternoon. The apartments where the shooting took place are located on the west side of Golfside, just south of Clark Road. The two boys and a 24-year-old man were arrested Thursday night after a shooting at the Lexington Club apartment complex, 2224 Golfside Road. Police said one of the 15-year-old boys shot a 33-year-old Ypsilanti man in the back of the head and left him bleeding on the ground. Washtenaw County Deputy Chief Assistant Prosecutor Steven Hiller said prosecutors have the ability to charge juveniles older than 14 as adults for certain crimes. The offenses are arson, assault with intent to murder, assault with intent to maim, attempted murder, conspiracy to commit murder, first- or second-degree murder, kidnapping, criminal sexual conduct, armed robbery and carjacking. Conspiracy to commit, or solicitation of, any of those crimes are also charges that can cause juveniles to be tried as an adult, Hiller said. Hiller declined to speculate on what charges these teens may face or whether they would be charged as adults. Pittsfield Township police responded to the complex at about 7:06 p.m. after receiving multiple 911 calls reporting a man on the ground, bleeding. The man was shot just outside the door to a building in the northeast area of the apartment complex, according to Deputy Police Chief Gordy Schick. The teens met the man at the complex shortly before the shooting, according to police. Officers are investigating whether it was drug-related. The teens were arrested at about 10:30 p.m. when Pittsfield Township police surrounded an apartment inside the building and ordered the suspects to come outside, Schick said. Police said the 33-year-old Ypsilanti man who was wounded remained in critical condition Friday morning. An update on his condition was expected later Friday afternoon. The teens, and the 24-year-old man they were arrested with, have not been charged with a crime and no arraignment is scheduled as of 2:45 p.m. Friday, Hiller said. Juveniles who are not charged as adults must be arraigned within 24 hours of their arrest, Hiller said. The apartment complex is meant for residents above the age of 55 and is generally a safe place, according to D.J. Jimenez. Jimenez came upon the scene of the shooting Thursday night when visiting his grandfather, who lives in the complex. He said he was surprised to see the area roped off by police tape and many police cruisers in the area. “There were like five cop cars every where, there was a police line and I was like, “Man, someone must have got murdered,’” Jimenez said. The investigation into whether the shooting was drug-related surprised Jimenez. He said he had never heard of any crime in the complex or any drug-related issues there. He said he’s been coming to the apartments to visit his grandfather for the past year. “It’s a safe place,” he said. Hiller said there have only been two cases of juvenile offenders charged with murder as adults in Washtenaw County since 2000. Among all of the offenses, an approximate average of 10 juveniles are charged as adults each year in the county, he said. Sat, Jan 21, 2012 : 9:30 p.m. Sat, Jan 21, 2012 : 4:52 p.m.
What is the argument here? These two teenagers participated, probably as training partners in how to enforce a drug deal. They probably acted on their own volition. What's the say that if they are treated as juveniles under the Holmes Youthful Defender Law that when they reach 21, they will be rehabilitated. This law has not proven to be a great success for kids who commit violent crimes. Sat, Jan 21, 2012 : 6:25 p.m.
And if they commit a crime when they are 21, they would be adults. Wow, is that hard for you to understand? We do not lock people up based on the fact that they MIGHT commit a crime in the future. Though with things like the Patriot Act that may one day change. Juveniles should be charged under the laws in place for them at the time of their crime, not the potential for future crimes. Sat, Jan 21, 2012 : 3:31 p.m.
Sun, Jan 22, 2012 : 2:22 a.m.
Work with teenage brains everyday. A great probability that ive been to more conferences on the topic of brain research and the adolescent brain than you. That is why having a responsible, loving mother and father who create a rich and nurturing environment is essential. The achievement gap in A2 is no mystery. A healthy diet and adequate sleep, language development and experiential learning are quintessentisl to normal brain development Unfortunately, too many babies are having babies and are in no positioin to provide the basic coomponents These kids are sent to school with damaged brains. Of course, that is too politicaly incorrect to state out loud. Hence the never ending cycle of ineffective efforts to close the the achievement gap. Sat, Jan 21, 2012 : 6:30 p.m. Sat, Jan 21, 2012 : 2:43 a.m. Sat, Jan 21, 2012 : 12:20 p.m. They cared enough to double the public safety millage. Of course that just allows them to use millions from the general fund for the things they do care about, like hiring their friends, building asphalt paths between each others neighborhoods, and defending their actions in federal court. Sat, Jan 21, 2012 : 4:40 a.m.
Crime has gone down all over the country. Fact. Fri, Jan 20, 2012 : 11:29 p.m. This is a 55+ complex? What were these punks doing there beyond creating havoc? Sat, Jan 21, 2012 : 12:45 a.m.
As suggested earlier, perhaps well-meaning grandparents had taken them in. No Gramma.....it would be better to make parents responsible for what their children do and make them pay a price for not knowing what their children are doing. it. It is time we stop letting everyone have children and expect society to care for them while the parents party. Fri, Jan 20, 2012 : 11:18 p.m.
We are one of very few countries in the world who treat children who commit crimes as adults. We keep sending younger and younger children to prison, yet it does not change the juvenile crime rates. We, also, do very little to protect these children as they are growing up. Among other things, it would be more helpful to spend money on schools not prisons and to provide more support, such as quality child care, to families of young children. Sun, Jan 22, 2012 : 4:12 p.m. There is a way to track children and what they are doing. It is called a cell phone. With a tracking device, I was told this can be done on a car too, all the information is stored and yes, if your child is out late? You will know. Sat, Jan 21, 2012 : 4:43 a.m.
Black Stallion - There is no possible way a parent can always know what their child is doing unless neither the parent nor the child every leaves the house. What you are proposing is ridiculous to the extreme. Teenagers lie. A lot. And frequently over nothing, just to get a parent off their back. You don't sound like you have ever had one? Sat, Jan 21, 2012 : 2 a.m.
Gramma &quot;We keep sending younger and younger children to prison, yet it does not change the juvenile crime rates&quot; If I were on this jury and the evidence supported a guilty verdict. I would not be trying to &quot;send a message&quot; and lower the crime rate! I would be getting 3 persons responsible for murder off the streets! Sat, Jan 21, 2012 : 12:24 a.m. In some countries? They do. Wish we would here. Might make a parent think twice about what their children are doing tonight. Fri, Jan 20, 2012 : 11:13 p.m. 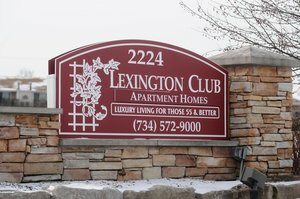 When my Father-In-Law lived in Lexington Club in 2004-2006, they were renting apartments to low income people under the age of 55 to keep the apartments full. Sat, Jan 21, 2012 : 12:42 a.m. It is my understanding that IF such an apartment complex is receiving Federal support, renters, regardless of age, must be admitted according to what Federal guidelines require (e.g., on basis of a disability). I do not know whether Lexington Club receives such support, but I do know this was (and is?) the case at Miller Manor. We had an elderly relative who ultimately was afraid to walk the halls alone. Fri, Jan 20, 2012 : 11:30 p.m. This answers my question, and if I ever live in any 55+ community later in life, I'll be sure to find out if they are renting to anyone under 55. Fri, Jan 20, 2012 : 11:01 p.m. I don't think there is any evidence that putting someone who shoots another in the head is going to get rehabbed in the juvenile detention system. It just teaches them and others that they can get away with violent crimes. This is not shoplifting, this is a horrible, violent crime. They should be locked up for years and years, to protect others. Do you think when they turn 16, 17 or 18 they will be gentle, kind and nonviolent? Not much chance, if you look at the literature! Fri, Jan 20, 2012 : 10:49 p.m. Most definitely try them as adults and if you don't do that, then send their parents to prison for their crime. Let's also get tougher drug laws and go after these drug dealers. These kids will end up in the prison system sooner or later anyway so why not send them there now! How sad is this? Fri, Jan 20, 2012 : 10:10 p.m.
&quot;Washtenaw County Deputy Chief Assistant Prosecutor Steven Hiller said prosecutors have the ability to charge juveniles older than 14 as adults for certain crimes.&quot; Personally I think this age limit should be juveniles older than 16. I agree that 15 year olds should know better than to take a persons life but with the television shows and video games that they play, not to mention the &quot;thugs&quot; running around Ypsilanti (nothing against Ypsi and I live in Ypsi but it's a fact), they are being taught that it's ok if they are upset or just want something. When I was 15 I knew the difference between reality and television, but many teenagers I come in contact with today are so oblivious to real life. Violence is so common for them and they think it's the way to solve all problems. Putting them in prison isn't going to teach them any different. Teenagers that commit such crimes should not &quot;get off&quot; as some people put it...but prison isn't going to solve the problem. They need strict sentences in juvenile facilities, rehabilitate and teach these kids how to have a real life instead of just giving up and throwing them away. Sat, Jan 21, 2012 : 4:05 p.m. I currently go out of my way to help troubled teens and would be happy to keep doing so. Unlike those who try to ignore the problem, I'm trying to be a part of the solution. Of course I can't do it myself and I wish more people would put forth an effort to both raise their own children with proper values and help others who aren't as fortunate to have parents who care or are in a position to do so. Sat, Jan 21, 2012 : 3:48 p.m.
And after they're &quot;rehabilitated&quot; they can move in with you. Fri, Jan 20, 2012 : 10:09 p.m. Charge the 15 year olds as adults and get them off the streets. Let's hope they're not sent before a bleeding heart liberal judge. Fri, Jan 20, 2012 : 9:57 p.m.
My first comment was deleted, so will try again: In my humble opinion, these 15 year olds should be tried as adults because I think, generally speaking, that 15 year olds know that shooting someone in the head is wrong. I hope this comment is not seen as blaming the victim, because really, clearly, the man who was shot is the victim, not the young men, or the 24 year old. There is no indication that this was self-defense, and we do not have any hint of insanity pleas, although that may come later. Were the guns stolen? Usually criminals don't like the waiting periods and background checks that U.S. Citizens endure to obtain firearms legally! Fri, Jan 20, 2012 : 10:21 p.m.
Actually there is no waiting period.There is a &quot; instant&quot; background check though.I &quot; &quot; instant because I bought my kid a shotgun and the check never went though I had to wait 3 days to get it and I happened to be a Detroit cop at the time.It takes about 15 min to get a purchase permit for a handgun. Fri, Jan 20, 2012 : 9:54 p.m. Lets get real, many 55 yr. and over people, mostly kids and grand-kids are living with them (even in mobile home parks). I heard this shooting go down on my scanner. (for over 3 hours). Many officers were called to the scene, it was horror on such a cold night. If I remember correctly, one of the officers went to the hospital to check on the victim and he was in surgery. (glad someone had time to run off and get these officers some coffee). As far as the two 15yr. olds, I have no doubt in my heart that they should be charged as adults. It's time owners and managers go in and check the residents, who is living there, how many animals they have ect. (the renters should be cited) if not living by the rules) It matters not to me if the renters are 55 or 85 yrs. of age. I know a lady (70) that has teenage granddaughter (18) living with her and her husband. (neither are well) No education, no job, no car,and a slob. Let me add, NOT in this complex! The victim is in my thoughts and prayers for recovery and hopefully can he help in the investigation. Fri, Jan 20, 2012 : 9:53 p.m.
so they shot this guy and then stayed in the same complex? they must not watch crime shows on TV. either way. not bright at all. i would say what I think should happen to them but I would get deleted. so use your imagination. Lock them up for 3 years then try them as adults and if found guilty put them in prison for life. Sat, Jan 21, 2012 : 12:22 a.m.
Can't. It is called double jeopardy. Can't try anyone twice for the same crime. Yes theyoung men are 15 but at 15 you should realize the results from taking a human life! If they did it try them as adults, I don't want to have to worry about getting shot by kids because they think they will get off if caught. Fri, Jan 20, 2012 : 9:14 p.m. Sat, Jan 21, 2012 : 10:05 p.m. According to an article I just read, a 7 year old cannot be held as an adult because they cannot comprehend what they did is just. But yet a 10 year can? Then what you are saying an adult goes to jail because he got funny with a 17 year old. But what I don't comprehend is a 17 year old model just married some guy over 18. So someone please tell this. Where is the fine line? Sat, Jan 21, 2012 : 6:19 p.m. Sat, Jan 21, 2012 : 2:54 p.m. Shooting someone in the back of the head is not an accidental mistake. Such a crime deserves treatment more severe than a lock up in juvenile hall. Sat, Jan 21, 2012 : 12:21 a.m.
A teen can get a drivers license at 14 years and 9 months. Start driving more at 15. In Florida they charged a 13 year old boy with a brutal slaying. So, I say yes, charge them as an adult if the crime is heinous enough. Fri, Jan 20, 2012 : 10:25 p.m.
&quot;does not lower the juvenile crime rate&quot; Really? I can guarantee you IF a Jury finds them guilty and they are sentenced as adults. They won't be killing anyone any time soon. So there will be 3 scum bags off the street. Hence no crime! Fri, Jan 20, 2012 : 9:51 p.m.
That is bull and you know it. This is what happened to Millor Manor. Elderly people feeling sorry for their abandoned grandchildren...take them in, and before you know it...you've got the Morrison hotel. Fri, Jan 20, 2012 : 9:02 p.m. Headline Yesterday Woman involved in August break-ins in Ann Arbor sentenced to up to 15 years in prison. A TV was stolen from one home, and electronics were stolen from two others Headline Today: Teenagers arrested for apartment complex shooting could be charged as adults Police said one of the 15-year-old boys shot a 33-year-old Ypsilanti man in the back of the head and left him bleeding on the ground. The offenses are arson, assault with intent to murder, assault with intent to maim, attempted murder, conspiracy to commit murder, first- or second-degree murder, kidnapping, criminal sexual conduct, armed robbery and carjacking. Is there ANY question they should be charged as adults? Sat, Jan 21, 2012 : 2:15 p.m.
Jack I would argue there are 50 and 60 year old's who's brains are not fully developed. Maybe we should not put anyone in jail regardless of their age! Because there are many at all ages that commit crime as soon as they are released. Sat, Jan 21, 2012 : 4:38 a.m. Yes, there is a question. It is a horrible crime. But they are really kids. Kids do very stupid things. Their brains are not even fully developed until between 25-30. What do you think the result will be of a kid being raised in prison? There was a youngster tried as an adult at age 11 (that was the age when he committed a crime at any rate) for murder. Within a week of coming out of prison years later he committed another crime, one that involved bodily injury. What else can we expect: I don't think trying kids as adults is a solution. Our country has gone a little mad with revenge and zero tolerance is not working. Sat, Jan 21, 2012 : 2:30 a.m.
jcj those are the crimes that juveniles can be charged with as adults. Those are not the total of charges in this particular case. Fri, Jan 20, 2012 : 8:49 p.m.
15 year olds involved with drug dealer and shooting someone in the back of the head? They should be treated as adults, even though they weren't acting anything like an adult. Sat, Jan 21, 2012 : 2:52 p.m.
May have jumped the gun (bad pun) since the officers were only speculating it was drug related. Fri, Jan 20, 2012 : 9:01 p.m.
Do we KNOW that it's a drug deal--there are charges ranging over a wide variety of offenses named above. Maybe we should wait until more of the details emerge. Fri, Jan 20, 2012 : 8:20 p.m. The names of the suspects in this case have not been released because these three individuals have not been formally charged with a crime and arraigned on those charges. As per AnnArbor.com policy, we do not release the names of suspects until they are arraigned. We will be following this case and, should these three people be charged and arraigned, we will report on it. Sat, Jan 21, 2012 : 12:19 a.m. But most times if teens are involved their names cannot be release, right? Due to privacy issues? Or have they changed this law? Fri, Jan 20, 2012 : 8:18 p.m. Given the fact that Lexington is a community for people 55 and over, why were the teenagers there? Were they visiting family? That would be a helpful detail to know. Fri, Jan 20, 2012 : 8:21 p.m.
We're expecting an update from police this afternoon and that is definitely a question I'm looking to ask. As to this point, we haven't been able to get more information from police on the shooting since this morning. Fri, Jan 20, 2012 : 8:11 p.m.
so dj jimenez's grandfather is his dad? Fri, Jan 20, 2012 : 8:14 p.m.
That was a typo and has been fixed. Fri, Jan 20, 2012 : 8:09 p.m.